Apologetics.Bible is all about APOLOGETICS. The website is dedicated to best in class training in Christian apologetics in effort to equip believer's in Jesus Christ to give an answer for the hope that lies within them (1 Peter 3:15). Apologetics is the discipline that deals with a rational defense of Christian faith. It comes from the Greek word apologia which means to give a reason or defense. For more about what apologetics is, click here. Post-modernism has breached the church and three out of four Christian college students leave their faith after the four year college experience; most after their first year at the university. Apologetics.Bible's goal is to stem the tide by equipping churches, leaders, youth and families to better defend and advance the Christian faith through various means. Apologetics.Bible provides free resources such as the Reason For Truth Podcast, Articles, and Seminar Training. 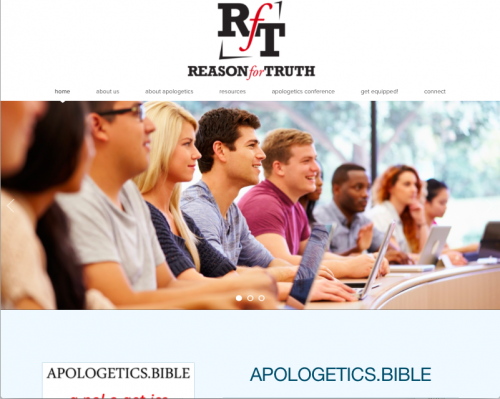 Apologetics.Bible is hosted by ReasonForTruth.Org, an apologetics and evangelism ministry dedicated to equipping youth, families, and church leadership to share their faith in our 21st Century post-modern culture. Read more about how Apologetics.Bible Provides the Best Training Resources for Explaining Christianity. Also, listen to this podcast interview with Steven Garofalo about Apologetics.Bible or watch the interview video.